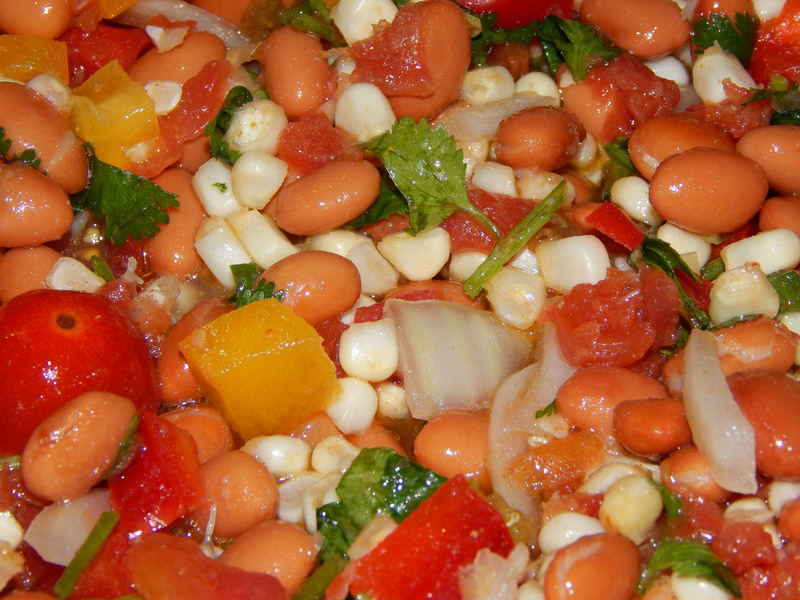 I developed this very easy and tasty recipe about a week ago when I was trying to figure out what to do with two cans of pinto beans that were close to expiration. I’d been eating a lot of chilis (thanks to Amy’s Kitchen) and wanted something a bit lighter tasting and more springlike. 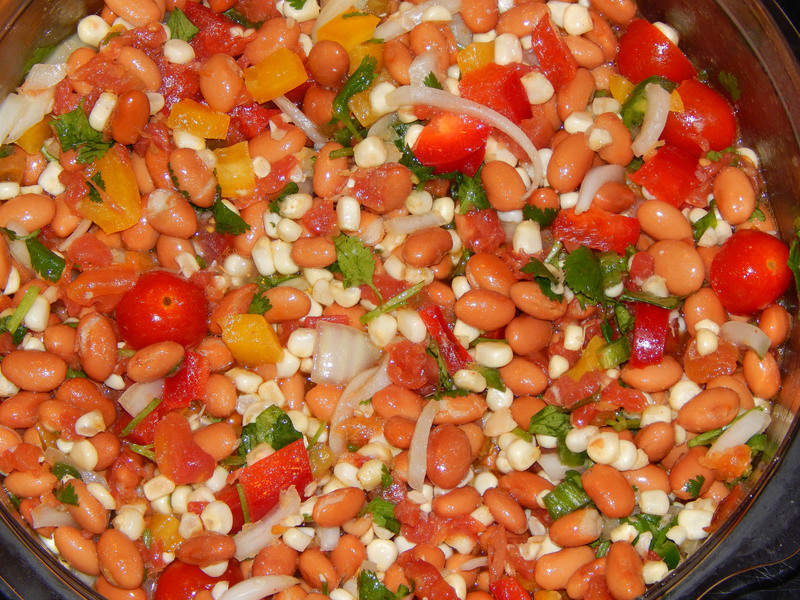 I’d made chickpea salads before, black bean salads, and black eye pea salads – why not a pinto bean salad? Why not indeed? 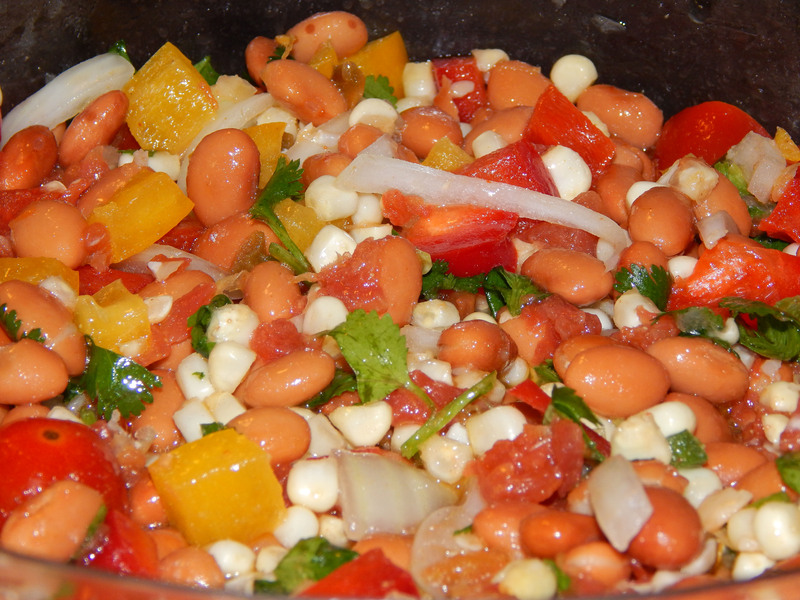 I was very pleased with this mildy spicy pinto bean salad – perfect for Cinco de Mayo. Rinse and drain the pinto beans, then place in large mixing bowl. With a knife, slice the uncooked corn kernels directly off the cob into the bowl. Add onion, bell pepper, jalapeno peppers, and tomatoes. Stir gently to mix. Add the chopped cilantro, but don’t stir the cilantro in with the rest at this point. Make the salad dressing by combining all the salad dressing ingredients. You can whisk them together in a bowl, put them in a blender for a few seconds, or simply add everything to a clean glass jar, put on the lid, then shake. Pour the salad dressing over the bean mixture and stir gently. REFRIGERATE for 1-3 hours to allow the flavors to develop. As always, modify the recipe to suit your own taste! If you don’t like pinto beans, use black beans. If you like your salads on the mild side, use only one jalapeno pepper and be sure to seed it. Or substitute milder serrano peppers. If you don’t have grape or cherry tomatoes, use two diced Roma tomatoes. Please do use fresh corn, if possible, instead of frozen or canned. There’s an incredible difference in taste and texture, plus it’s so cheap this time of year! If you’re making this for company or a potluck, it looks pretty to use two colors of bell pepper – such as red and green or red and yellow. I have the ingredients (even fresh corn) and had no idea what to make today, so thanks for this recipe! Great looking salad! Love all the veggies you’ve used! LOL didn’t think of that but it is, isn’t it? It is sure a nice salad! I love pinto beans, too! I’m so happy that Chipotle and other Mexican places are now leaving the pork out of the pintos!